Origins, growth and potential of dehydration; Factory organisation; Preparation plant; Dryers; Dehydration of potato products; Dehydration of vegetables; Dehydration of fruits; Spray dried products; Dehydration of meat; The formulation of dehydrated soup; Selection, packaging and storage; Quality control; Economics of dehydration. 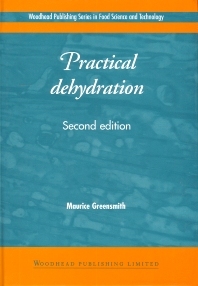 Practical dehydration has long been recognised as a standard text for the industry. In the second edition the author provides a reassessed perspective on this international industry. In addition to the original chapters on packaging, storing and quality control, this latest edition includes modern analysis of expanding sectors and new technologies. This book provides an invaluable guide to the practicalities and logistics of a changing industry.